In the so-called digital age, electronic devices seem to be everywhere. In the light of all the screens, smart devices and other electronics, it can be easy to forget that we’re also surrounded by non-electronic devices. These devices continue to have a profound impact on our lives. Though these devices may appear simplistic compared to electronic devices, they can still be quite complex. Many industries, including medical, automotive, aerospace and more, produce and rely on non-electronic devices for a whole host of valuable applications. To make sure non-electronic devices will perform as they’re supposed to in their intended applications, they must go through testing. Across all areas of manufacturing, testing is an essential means of ensuring products meet relevant standards. Mechanical testing is an important type of testing that is often a significant means by which manufacturers ensure the quality of non-electronic devices. In this article, we’ll look at what non-electronic devices are, what mechanical testing is, why exactly it’s performed, how these tests work and whether it makes more sense to conduct these tests in-house or outsource them. What Is a Non-Electronic Device? A non-electronic device either doesn’t rely on electricity at all or is electrical but not electronic. Electrical: Electrical devices convert electrical energy from an electrical current to another form of energy, such as heat, light or motion. By converting the electrical energy to one of these forms, an electrical device can perform a specific task. Examples of electrical devices include everyday devices like transformers, motors, lamps, toasters, electric mixers and more. Note that some of these devices could have an electronic component if they include more advanced features and digital displays, as is increasingly the case with modern electrical devices. Electronic: Electronic devices also use electricity, but rather than simply converting the electricity into another form of energy, they manipulate the electrical current in a way that introduces meaningful information. The electrical circuits in electronic devices are composed of active electrical components such as integrated circuits, vacuum tubes, transistors and diodes, as well as interconnected passive electrical components such as inductors, resistors, voltage and current sources, capacitors and transformers. Electronic devices can perform complex operations. Your cell phone, computer, television and more are all electronic devices. We can also make a distinction between electrical and electronic devices based on the strength of the electrical current involved. Electrical devices generally use a heavy current whereas electronics use a light current. As technological innovation continues, many devices that were previously just electrical devices are now being turned into electronic devices that can store or compute information, communicate in some way or perform another complex task. For instance, car engines are often built with computers integrated into the design that can run offer diagnostic information to both drivers and mechanics. However, non-electronic devices still have an important place in the world. So far, we’ve focused on the whole of a device to describe whether it is electronic or only electrical. When discussing non-electronic devices, it’s also important to consider the various materials and components that can go into a whole product. Consider your car again as an example. It likely includes both electrical and electronic components. It’s also made up of materials that are neither electrical nor electronic. The body of your car, for instance, is made up of materials like metal and plastic and is neither electrical nor electronic. Many other everyday objects, including tools, cookware, furniture and more, don’t include any electrical or electronic components at all. These non-electronic devices need to be strong and reliable. Non-electronic components and raw materials may not need to undergo the same testing as electronic devices, but that doesn’t mean they don’t need to be tested. Depending on the material and its end application, there are a variety of tests that may provide relevant insight into a product’s makeup and performance, such as hydraulics testing, environmental testing, chemical testing and many other testing categories. This insight is necessary for determining the safety and durability of a product. One important type of testing used on non-electronic devices is mechanical testing. Mechanical testing involves exerting high levels of some kind of force on an object and then measuring the object’s response. Examples of this physical force include shock stresses, vibration and strain. Standard-setting organizations have specified how to carry out various types of mechanical testing to achieve consistent, accurate results. These organizations also determine many of the standards that serve as benchmarks for characteristics measured in these tests. This standardization ensures consistency across various products and manufacturers. 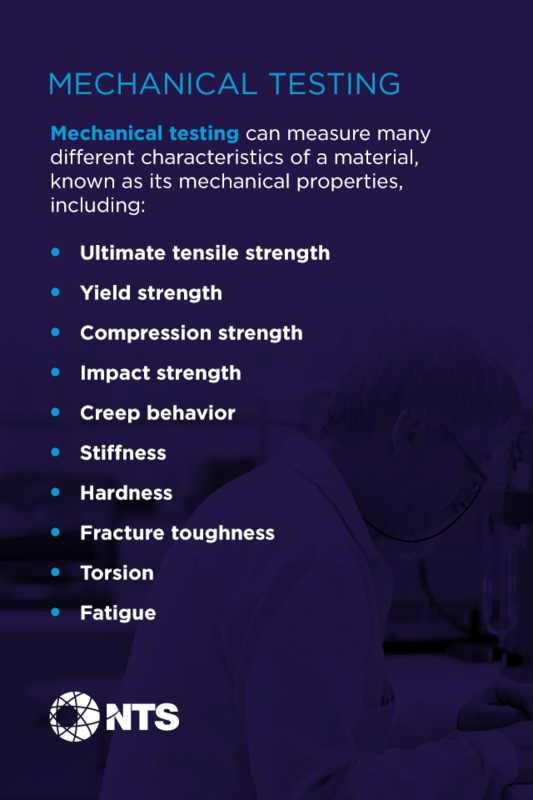 Ultimate tensile strength: Ultimate tensile strength (UTS), often shortened to just tensile strength, is a material’s ability to hold up to tensile stress, which involves pulling the two ends of the material in opposite directions. The point at which a material under tensile stress breaks indicates the material’s tensile strength. Consider the importance of steel cable in construction, for example. All cables must be tested to ensure functionality as well as safety for the consumer or operator. Yield strength: A related measurement to tensile strength is yield strength. Yield strength refers to the point of tensile stress at which a material changes shape permanently, meaning its ductility meets its limit. Before this point is reached, the material should go back to its original shape when it’s no longer being pulled on. Compression strength: Also called compressive strength, compression strength refers to a material or object’s ability to withstand loads that would compress, or reduce the size of, an object. This inward pressure is the opposite of tensile stress, which pulls on an object to elongate it. This testing is often done on materials designed to be load-bearing. Impact strength: An object’s impact strength, sometimes also called impact resistance, is determined by the amount of energy it can absorb from a sudden impact or shock force before it fractures. The shape of a device can significantly play into its ability to absorb impact. For the automotive industry, the impact strength of both materials and designs is paramount in the manufacturing process of any vehicle. Creep behavior: Creep behavior is more of a long-term concern. It is a material’s tendency to gradually deform under mechanical stresses. Whereas a material may have a yield strength that should allow it to bounce back to its original shape after being under stress for a short time, longer exposure to that same stress could eventually cause permanent deformation. Stiffness: Stiff materials are the opposite of flexible, meaning they remain stiff and rigid when they’re subjected to a load. Stiffness is defined as a material’s tendency to return to its original form once it’s been subjected to a force. A stiff material’s shape only alters slightly under elastic loads. Hardness: Hardness measures a material’s ability to resist being indented. In some cases, as with steel, hardness is roughly proportional to tensile strength, but strength and hardness are two different things. One thing to note about hardness is that it is not an intrinsic property of a material. A complex combination of elastic behavior and deformation go into measuring hardness values. Fracture toughness: Fracture toughness refers to a material’s ability to resist fracture, or cracking. Testing for fracture toughness involves the assumption that a material contains preexisting flaws that could turn into more serious fractures under tensile loading. This characteristic is critical for understanding how a product will perform out in the real world. Torsion: Torsion involves twisting a material, meaning a force is turning the ends of the object in opposite directions, leaving the middle of the object left alone. The twisting force being exerted on the object is called torque, and the resulting stress is called shear stress. If the object is deformed due to being twisted, this deflection is known as strain. Fatigue: Fatigue comprises anywhere from 50 to 90 percent of all mechanical failures. It refers to a material weakening due to repeatedly applied loads. As loads are applied to a material, some structural damage could occur, starting out as microscopic cracks and eventually turning into more serious cracks that cause the object to fracture. An object’s shape can play a role in how well it can resist fatigue. While some industries and products are more prone to suffer fatigue-failure, to varying degrees of consequence, this aspect of a material’s quality is always key. Other characteristics can also play into a product’s performance, and these characteristics can also be tested. For example, corrosion is damage that can occur gradually to materials as they react chemically with their environment. Many metals corrode unless they are galvanized or otherwise coated in a protective seal. Corrosion resistance is a characteristic that refers to a material’s ability to resist becoming corroded. This is an especially important characteristic for materials subjected to humidity or chemicals. Both the mechanical properties listed above and other characteristics of materials are determined through testing, which we’ll discuss more in the next sections. Why Is Mechanical Testing Performed? Mechanical properties of materials, such as tensile strength or hardness, can impact a product’s overall quality and performance, so any manufacturer with a commitment to quality control should do all necessary testing to ensure their products are up to par. Mechanical testing, though it’s done in a controlled way in a lab, determines whether a product can withstand the type of stress it may be under out in the real world. These tests follow standardized methods so that the results are accurate and can be reliably compared with the results for other products and materials. Putting non-electronic devices through mechanical properties testing is necessary for making sure your products meet standards laid out by national or international standard-setting bodies. Most of these relevant standards come from ASTM and ISO. ASTM originally stood for The American Society for Testing Materials, but ASTM is now an international organization. The International Organization for Standardization (ISO) is another standard-setting body whose standards are widely recognized. Whether from ASTM or ISO, these standards create a baseline that gives consumers confidence when purchasing products. They should know they’re getting a quality product that meets basic standards for safety and function. Without adhering to these standards, manufacturers may be endangering their consumers and opening themselves up to legal ramifications should a product fail catastrophically. 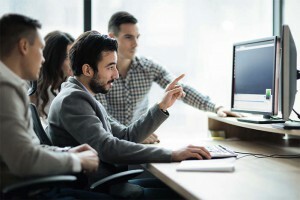 Beyond these baseline standards, some manufacturers may have higher standards that govern their products, either specified by their own company or by an industry-specific standard-setting body. Manufacturers should understand their product’s intended use, environment and the possible types of stress it may be under and should consider what sorts of standards their materials would need to meet to perform well in this context. For example, the U.S. Military has its own specifications and standards to ensure that military-grade products can stand up to various types of wear and will function reliably. Manufacturers who produce products intended for military use may pay attention to these standards. Another example is the automotive industry, where standards from the Society of Automotive Engineers (SAE) may govern their benchmarks for quality. How Are Non-Electronic Devices Tested? Since tensile stress is an outward force pulling on an object in opposite directions, in every case, tensile testing is aimed at creating this outward force in a controlled way. Each of these tests works a bit differently to provide unique information about a material’s ability to withstand cracking and for small flaws to resist growing into more serious cracks. Mechanical testing can happen in-house in a manufacturing facility, or it can be outsourced to testing companies. Especially as the standards for products’ quality and safety increase, many manufacturers are struggling to dedicate the time and funds necessary to conducting tests in-house. After all, each test requires certain mechanical properties testing equipment along with a testing engineer who has the expertise to carry out the test correctly and produce an accurate result. Testing the mechanical properties of non-electronic devices is an exact science. Depending on the specific standards a product should meet, it will need to undergo certain tests that should be conducted in an exact, methodologically-sound way. Companies that offer testing services are typically better equipped to perform all the necessary testing for your products. After all, this is what they’re experts in — it’s what they do. NTS provides testing services for companies and government organizations all over the world. Our more than 50 years of experience and advanced expertise makes us a reliable partner for any type of testing, including mechanical testing of non-electronic devices. 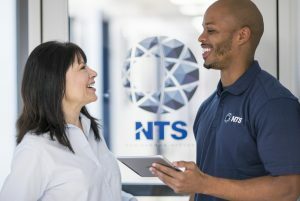 If you want to learn more about how NTS can help your company achieve quality standards, call us at (844) 332-1885 or contact us online. We are happy to offer you a free quote if you’re interested in our testing services or any our other valuable services.